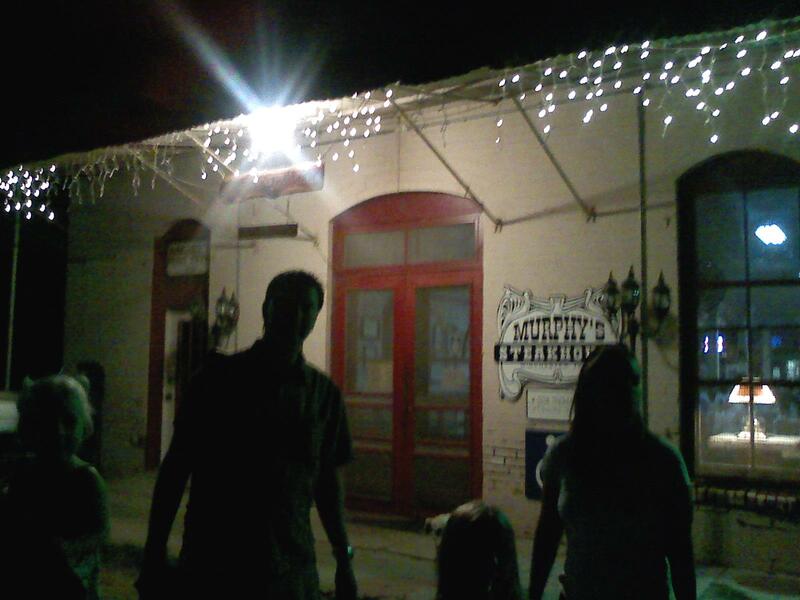 In a quest to do something newish, my best good friend and I headed out to the Hangin’ Tree Saloon in Braken, TX http://www.hangintree.com/. I say ‘newish’ because we have been there twice before BUT it was the last stop on a pub crawl and it would be putting it politely to say I was not in my fullest capacity to take in the place. So we went in the daylight, without having been to four other places first. My best good friend has the ability to run into someone she knows everywhere and the Hangin Tree was no exception. That man with the drink was walking out of the bar as we were walking up and she knows him. This set a nice, relaxed tone for the evening. Inside is very dark and it took a few moments for my eyes to adjust. 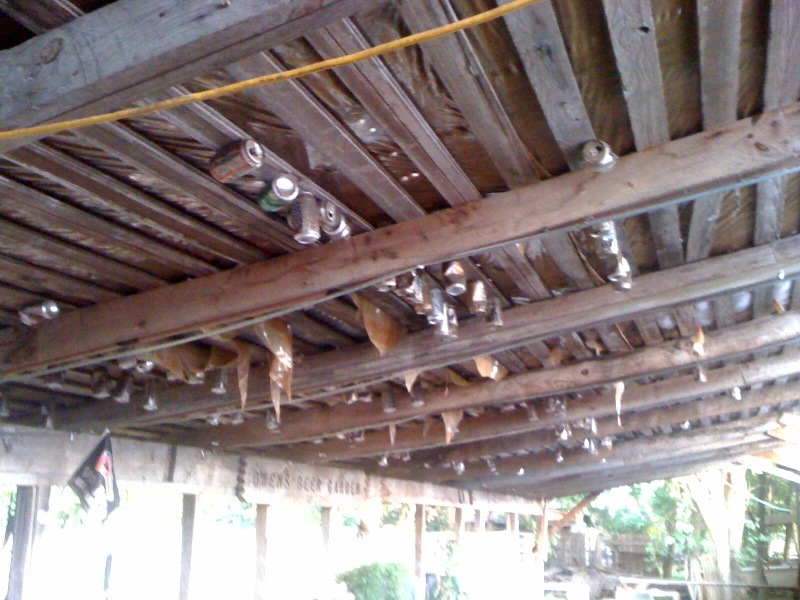 Later, the ceiling christmas lights came on and it was more festive. We ordered a beer and stumbled upon a beer garden in the back. We only stayed out there for a moment because a mosquito almost carried off my purse but the table comprised of a tabletop balanced on a bar stool had a kind of charm to it. Back inside, we settled down at the bar just off the dance floor. An elder gentleman sat down next to me and chatted with us the remainder of the evening. Bill delivered Buttercrust bread all around Texas for thirty some odd years, retiring in the 80’s. He had some great stories and was a pleasure to be around. That’s him in the white shirt and hat at the bar; that’s me with my mouth open. You know this is a great post because its got some many awesome pictures. Thanks to the official photographer of HTF, AR! Murphy’s Steakhouse. Because Bohemians have to Eat too. Headed over to Winchester, TX this weekend, on the way to La Grange. A tiny town of about 50 people, Winchester is in the northwest portion of Fayette County near the intersection of FM roads 153 and 448. My great grandmother used to live across the river as a child; her brothers would come over to Winchester and spend time with the ‘Bohemians’ there. I kept my eyes peeled for some but I am not completely sure what that term encompasses and they may have been sitting just behind me. Alas. The restaurant is in a rectangular building originally built in 1913 and is largely in its original condition, including the tin ceiling, brick walls, and mirrored bar. It was built by a Schmidt, as noted atop, so it is good, sturdy construction. Inside was busy and a hair chaotic. As the evening went on the crowd and the servers settled down. Mostly families, mostly people who knew each other, and evidence of people from nearby Giddings and La Grange. We were seated a long table towards the front. The service was a little slow but the waitress was very nice and on the ball. Everyone at the table ordered steak, except one of the kids (chicken strips) and me (frog legs). Salad bar, included on most meals, is in the back, with a setup I found quite odd for two reasons. One, there was a bean station. The beans were warm pinto beans for the taking. I found this intriguing because the place is a steakhouse. While I have been to many Mexican restaurants that serve beans as an appetizer, never have I seen it in a steakhouse. Like many eateries in Texas, Mexican food is usually somewhere on the menus so the concept was definitely there. Two, the salad bar was cube shaped with the lettuce bowl in the middle. I like this idea in theory but in a small space, crammed next to a bean station, some type of order must be established for the system to work. The lack of flow created clustering and confusion; the regulars were quickly weeded out from the newbies. A lovely lady with bouffant hair in from on me demonstrated how she puts the ranch dressing on first, then the croutons to ‘glue’ them down. The beans and salad didn’t last long but someone had the foresight to order onion rings so that provided reprieve. They were quite good, crispy and hot, not too greasy, widely cut or stringy. Eventually the food came, hot and well cooked. 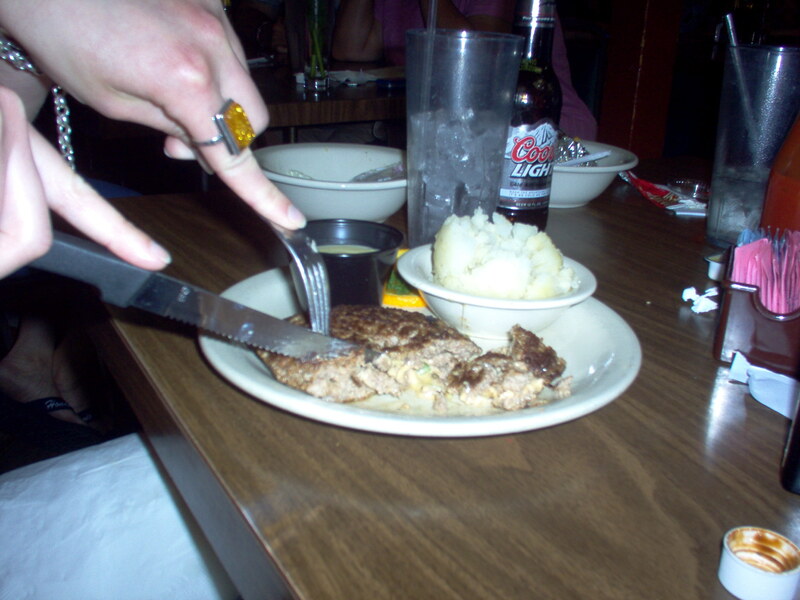 The steak temperatures leaned more toward rare and each plate sported a giant slab of vaca. Some cut were fattier than others but the general consensus was very positive and everyone came away full. My frog legs were tasty. Fried with flour, I pull off the outer crust because it tends to overpower the more delicate flavor of the meat. They were fresh tasting, like a swampy chicken. The side of wild rice was generously proportioned and well flavored with chicken broth. Murphy’s has an enjoyable small town atmosphere. People don’t mind kids and the waitress, although very busy, refills your tea and chats for just a sec about how she’s always wanted to try the frog legs. You just have to find Winchester and keep a sharp wit about you. In case you run into some Bohemians, of course. Wink invoking fact: All birds raise their lower eyelids to blink, except the owl which drops its upper eyelid. 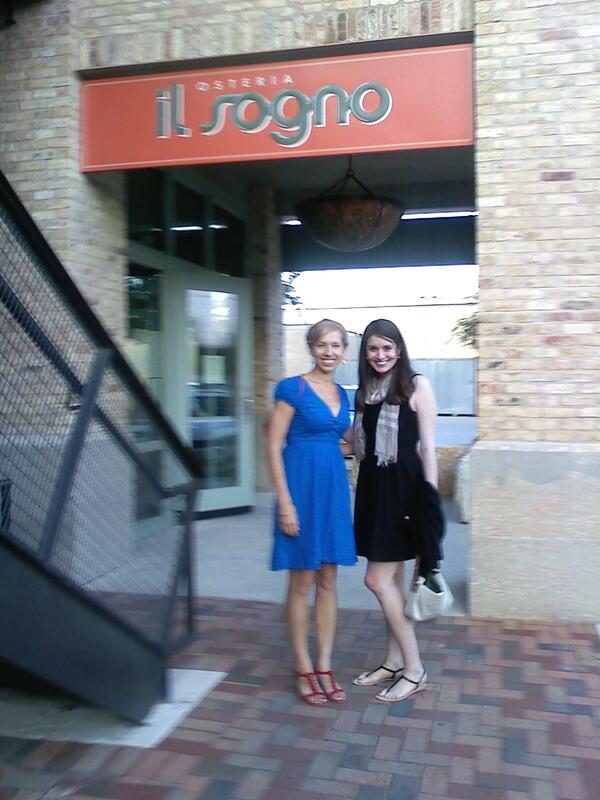 Met with two friends last night at Il Sogno, a restaurant opened as part of the Pearl Brewery revitalization project. I had read some reviews online mentioning terrible service and long waits but all revealed the food was excellent. We met at 6 on a Thursday evening, technically when they opened, although the door did not actually yawn unlocked until almost 6:15. 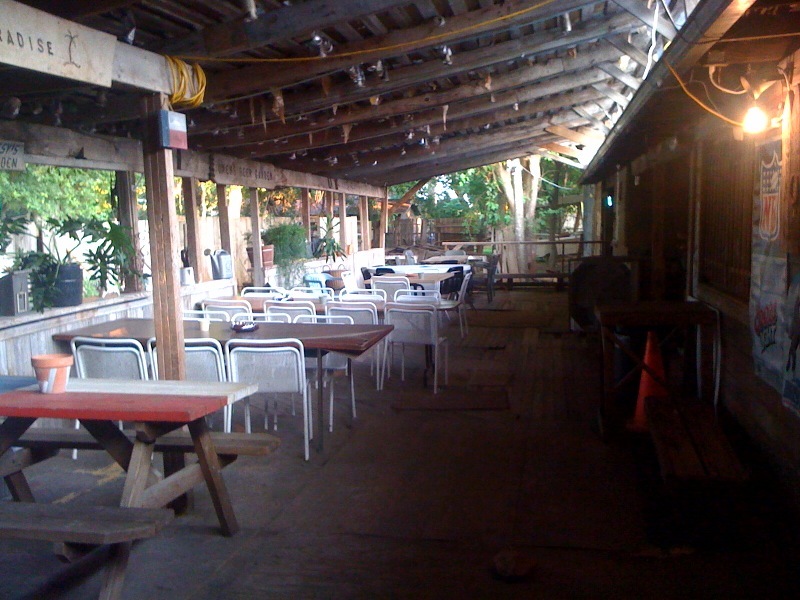 The building itself is small; the dining area is L-shaped with an outdoor patio in the elbow. Tables filled up quickly and water was brought immediately to our table, directly followed by a waiter with a platter of lemon, lime, orange or grapefruit for the water. Worth noting, the water server was VERY on top of the agua situation. None of glasses ever got close to half empty. Our waiter was knowledgeable, although a little too quiet for the volume level of the room. We ordered wine individually; he knew which of the options I proposed were the driest, and eagerly submitted to another’s request to sample a different wine than ordered, including bringing her another glass. An antipasti bar is against one wall. We ordered one large plate for the table to share, requesting the waiter create for us. I appreciated his inquiry as to preferences/ allergies (minimal cheese please!). He returned with a plate of lightly pickled beets, white bean mousse, fennel, grilled eggplant & zucchini strips, artichoke hearts with red onion, melba toast style crackers and square bread cuts sporting a muted sweet glazed top. Everything was prepared for optimal flavor of the food itself and even things I do not normally enjoy were palatable due to under emphasis on additional seasoning. The menu itself was a bit redundant, although I do not know how often it changes or if the kitchen creates its menu around items ordered. Asparagus was featured quite a bit which limited my choices a tad. I ordered one of two specials for the evening, wild boar atop fettuccini. Especially pleasing was the absence of cream sauce accompanying the fettuccini. I have always wondered why it is impossible to get this type of pasta sans creamy; now I know it is not. The dish was minimal, the boar in pulled pork style and noodles. It did come with a sprinkling of freshly grated Parmesan cheese originally, which was absent from my plate per request. 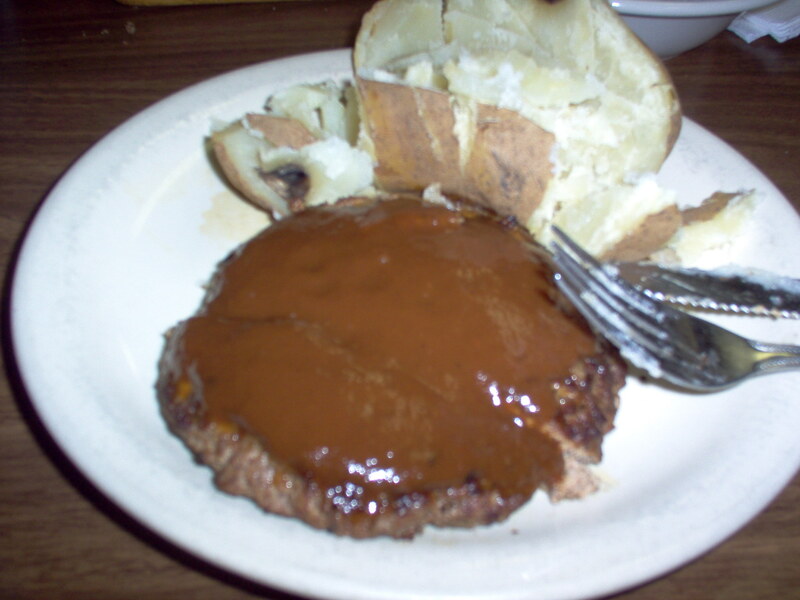 The meat was tender and featured very little fat. It was slightly sweet and rustic, paired well with the dry red wine. My only negative comment was the dish was lacking a secondary flavor between the meat and pasta. Perhaps this was the purpose of the cheese. Ultimately, I appreciated the unpretentious flavors and simplicity of quality ingredients and preparation. We chatted for a while and were never rushed or hovered over. Dessert menus appeared after a respectful pause between plate clearing. Several items looked delicious (Nutella, crepes, lemon sauce) but we finished our wine, paid and vacated the seats. The meal was expensive but combined with the skillfully crafted food, the helpful, precise staff, well-paired wine and a generally unfussy experience, Il Sogno is worth the price. As for the existing internet reviews, I can see how the staff would get frazzled and forgetful once that place really starts going. We went early and on a week day so staff calm was high, service impeccable. Seafood fun fact: Shrimp can swim backwards. 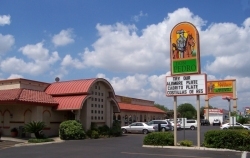 On the southside of San Antonio, there are many institutions. Missions, historical buildings, hot springs and don Pedro’s. Open since 1968, this restaurant is my grandmother’s favorite. Conveniently located next to the cemetery, after the service today, I loaded her into the official vehicle of Honkytonkfoodie and, along with my uncle, sat down in the delightful air conditioning for lunch. Since my boyfriend eats Mexican food for breakfast AND lunch most days, it is a rarity when I have it for dinner so I avoided the slightly healthier options. Enchiladas are a risky endeavor if you are not completely familiar with an establishment. But I had a vision from Our Lady of Refried Beans who told me to go for it. Two cheese enchiladas smothered in meaty sauce flanked with rice and beans. Oh, it was fantastically nostalgic. No annoying shredded lettuce and tomato plate filler, not suffocating under greasy melted cheese. Just great enchiladas, rice and beans with nothing to hide. My grandmother always gets the green enchiladas and swears by them, while my uncle ate the Monday lunch special of chicken and zucchini which actually looked quite tasty. This place is worth a drive down Military Drive. Seventh grade Texas history fact: Santa Anna brought chewing gum, as we know it, to the United States. 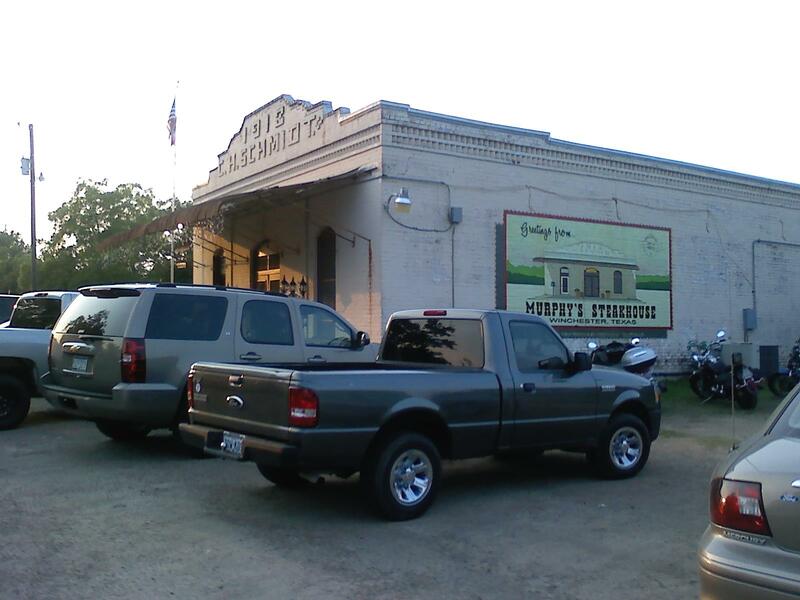 HonkytonkFoodie is on Facebook and the world wide web! You missed quite the excursion Saturday! 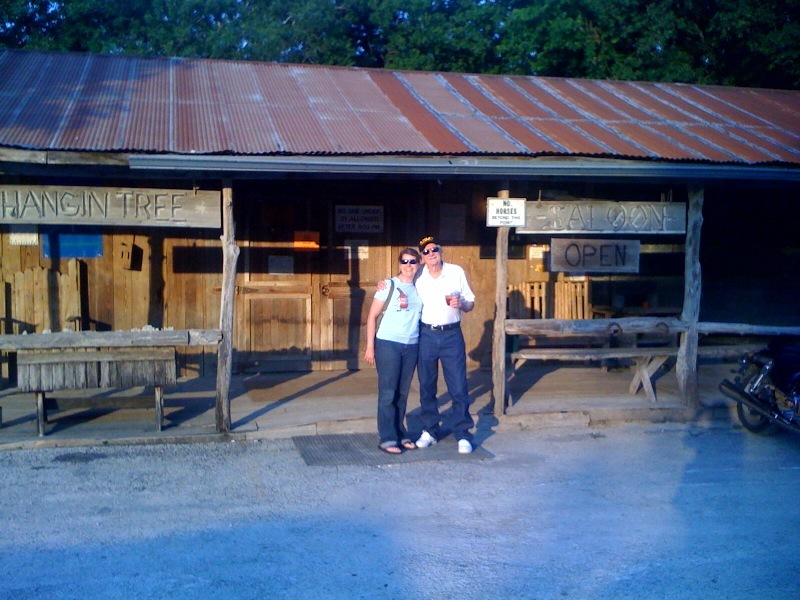 The reliable troops were rounded up for the first Hill Country Honky Tonk Tour sanctioned by Honkytonkfoodie. It included an old favorite, a tasty slice of heaven, served hot and an old joint in which none of us had ever been. After some discussion on routing, we eventually made it to I-35 South. 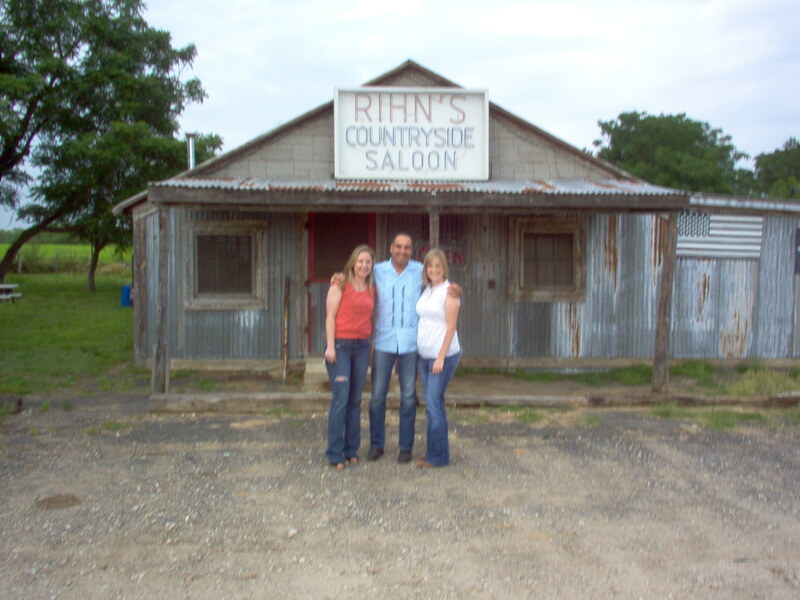 Exiting into, and quickly bypassing, the town of Devine, we cruised past a couple of hills to Rihn’s Countryside Saloon. 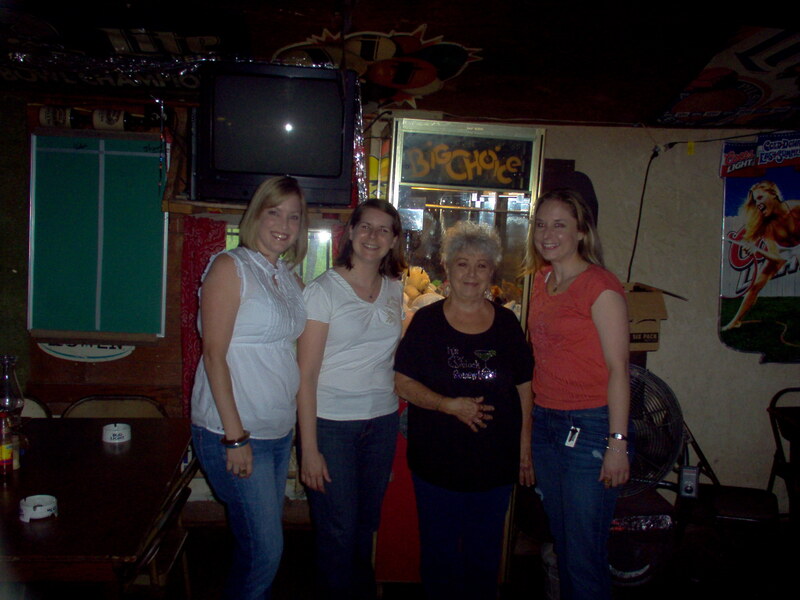 Sandra, whose been there 33 years, was in her usual spot behind the bar and remembered us straight away, even though its been at least four years since we were there. While she no longer serves Hooch, she still keeps her beer super cold and the bathrooms pimpin’ (more on that in a minute). We played some pool, pinball, Ms. Pacman AND the claw stuffed animal thing. And of course the jukebox. Which didn’t play all of our songs and is a tad expensive (3 songs for $1). I fully agree I am spoiled by Arkey Blues box that plays 7 songs for $1. 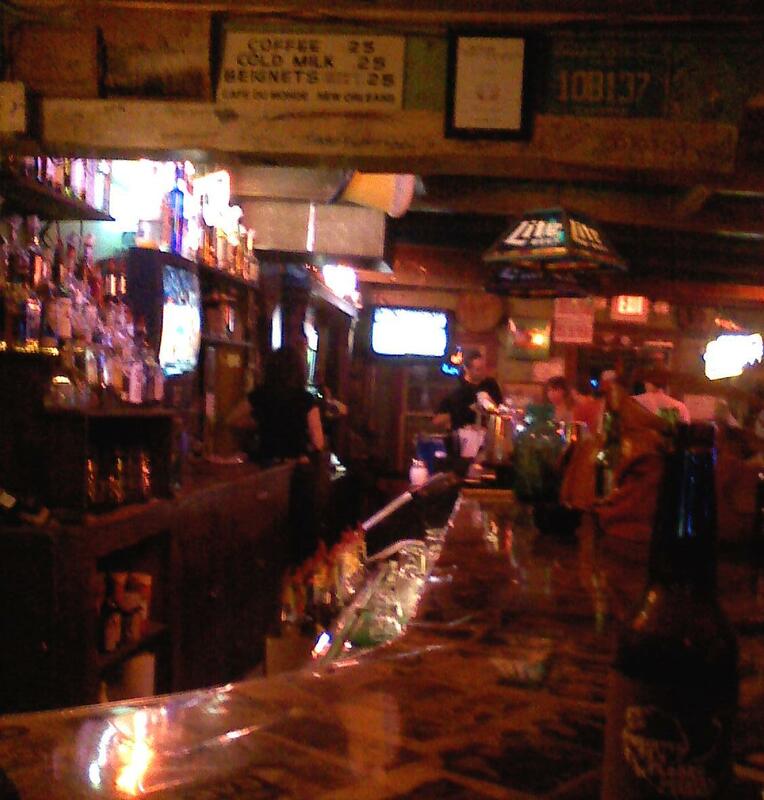 Rihn’s is a good place to chat before it really gets jumping, and then to blend with strangers as the night wears on. We took a parting pic with the hostess with the mostest on the way out. Thanks Sandra! 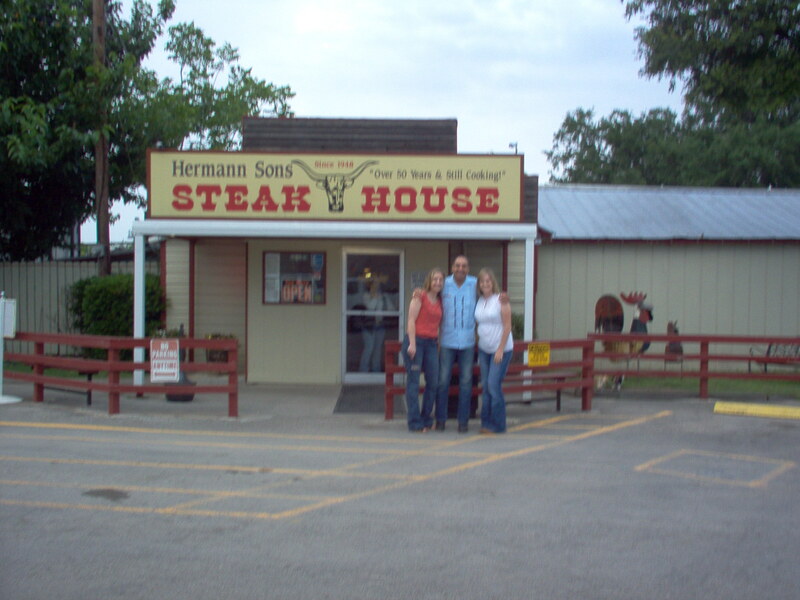 It was definitely time for dinner, so we cruised up the road to Hondo, back to Hermann Sons Steak House. Being Saturday night, the wait was 25 minutes but they let us drink beer while we waited which was right nice of them. As usual, the down home salad bar was tasty and the service was friendly (sometimes a tad too much so for one member of the group). 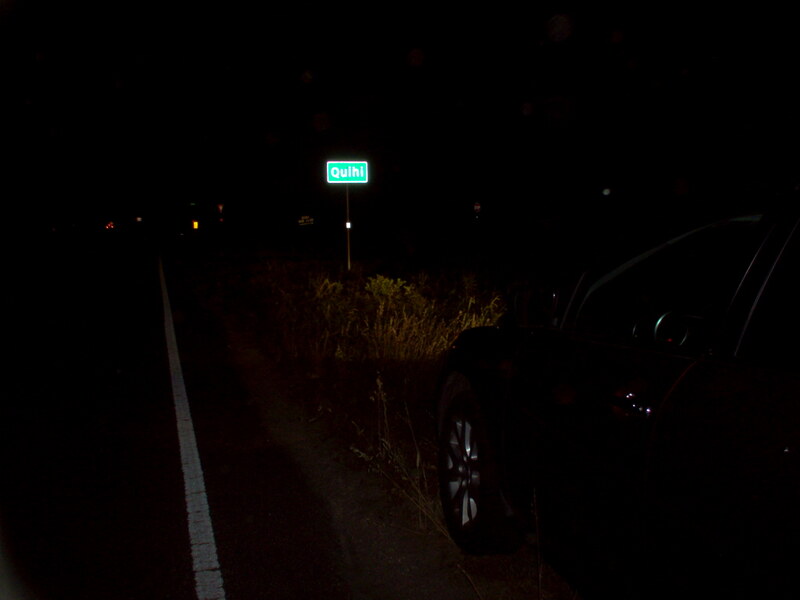 Quihi is no longer officially a town so we took a picture to prove the Google maps wrong. The dance hall itself was very family friendly on that night. An auction for a local FFA group was going on in the corner and a cover band played a quality South Texas range, from the Cumbia (which I danced) to Taylor Swift (which was a great time to pee). There were quite a bit of pre-teens running around, which gave the place a feel of a junior high dance but the night was more locals-oriented with the auction and the non-headlining band. Enjoyable people watching on multiple levels. People were friendly and the beer was a mere $2. This place is not air conditioned but there are swamp coolers and fans. Overall, a delightful trip. Beer was cheap all night, everyone was agreeable and I got to go somewhere new. Thanks so much to AS for driving! 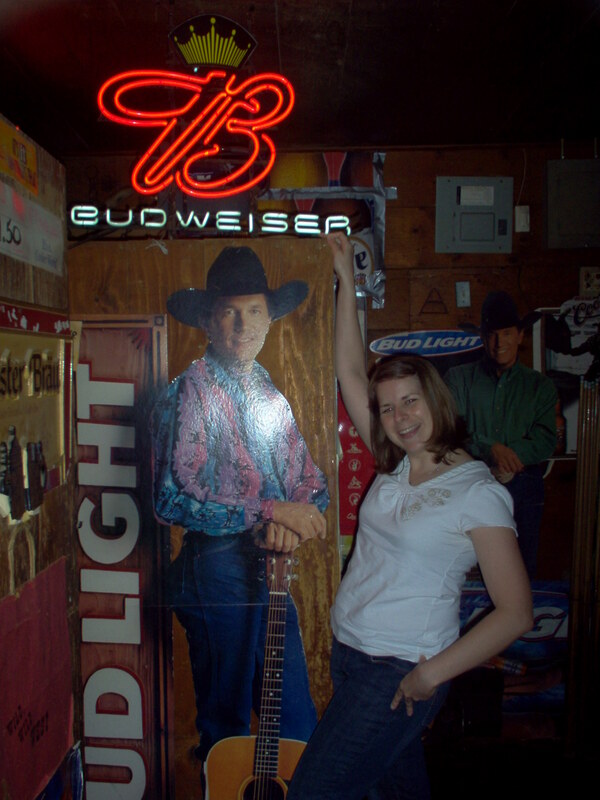 Oh, and on the way to the bathroom at Rihn’s, I met up with George Strait. I did not agree with his shirt choice. Muted out of Texas history fact: Out of 254 Texas counties, only one is named for a woman. Last night I met an old friend in San Marcos. Dinner and drinks were supposed to be involved but I got stuck in traffic so we went straight to the drinks part. 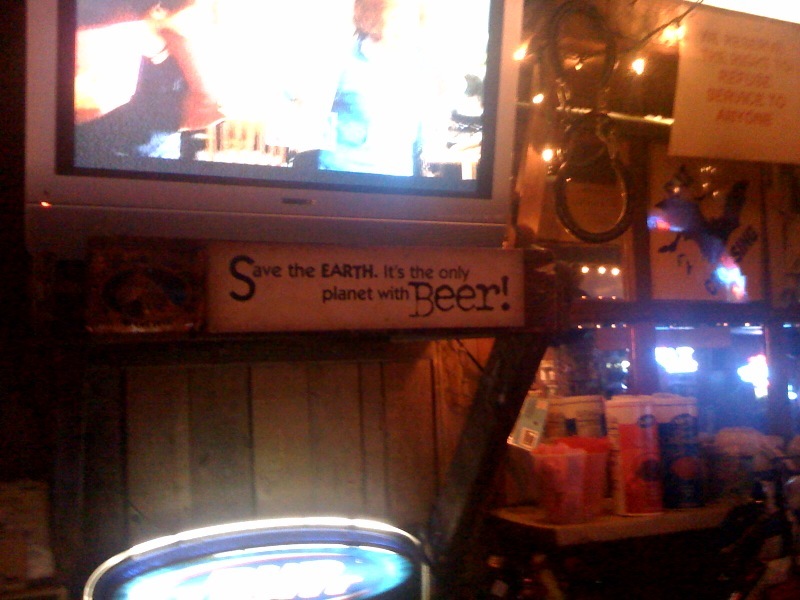 Just past San Marcos, in a spit of a town, in Riley’s Tavern. 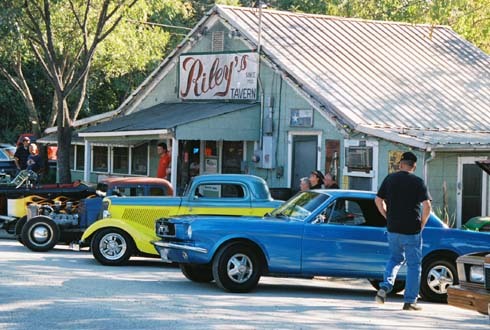 Billed as Texas’ first bar after Prohibition, the story goes like this: In September of 1933 J. C. Riley, at the age of 17, drove to Austin, Texas in a Model “T” car with his uncle. The purpose of this trip was to obtain a beer license for his soon – to – be beer joint at the end of prohibition. He camped out on the steps of the Capital building to be the first person in line and get the first Texas beer license. 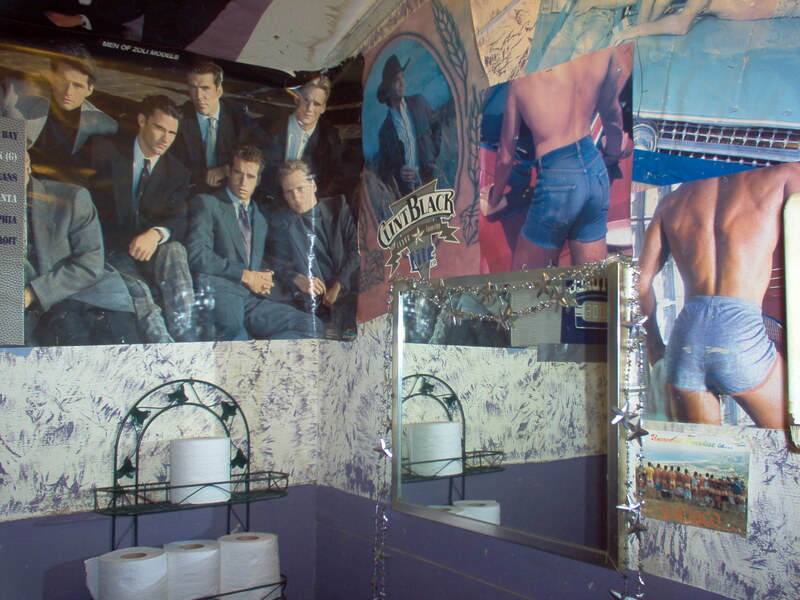 Riley’s has been open ever since. 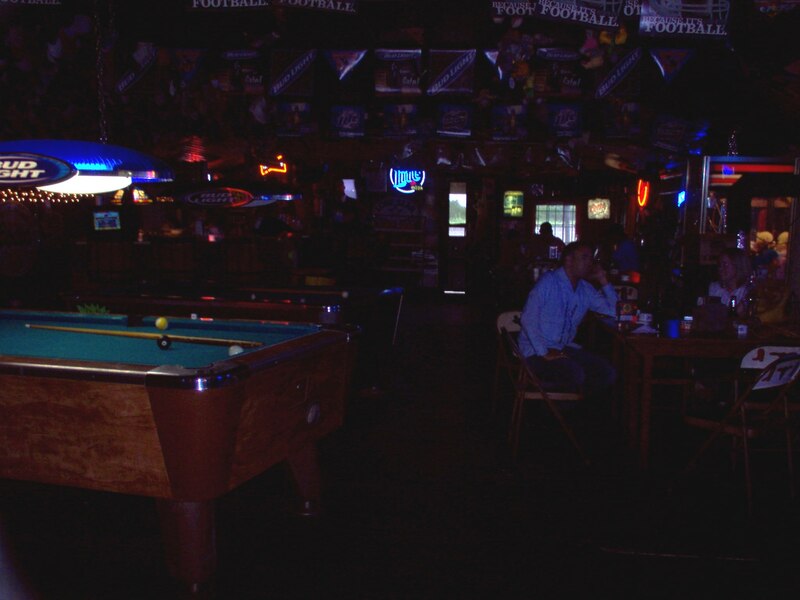 Inside, its a low-ceilinged place which is essentially three square rooms with the bar running the length of two. This picture is from the end facing the door. The first room has no tables but it open for band setup and dancing/ grooving. 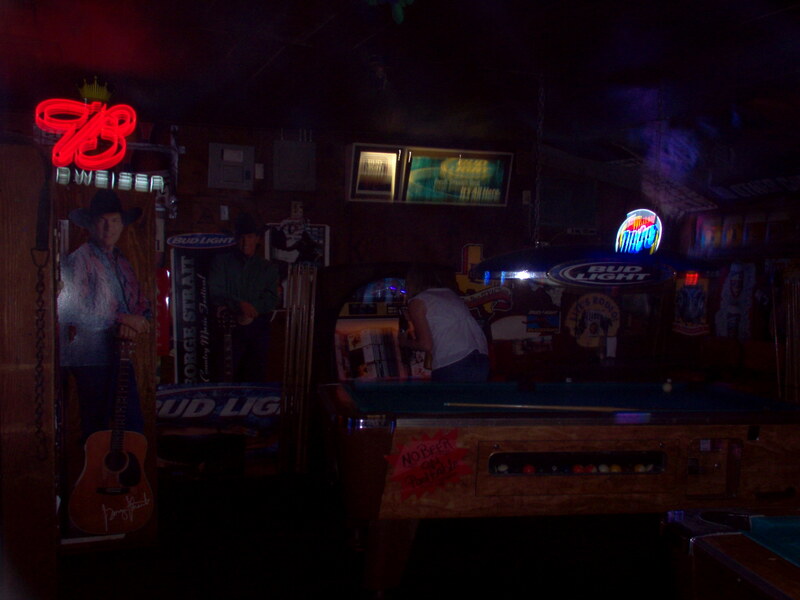 The second room has six high, round tables, while the third has pool tables and pin ball machines. Outside in the back are two shacks which contain the restrooms, labeled Mamas and Papas. There is a nice seating area and a horseshoe pit. 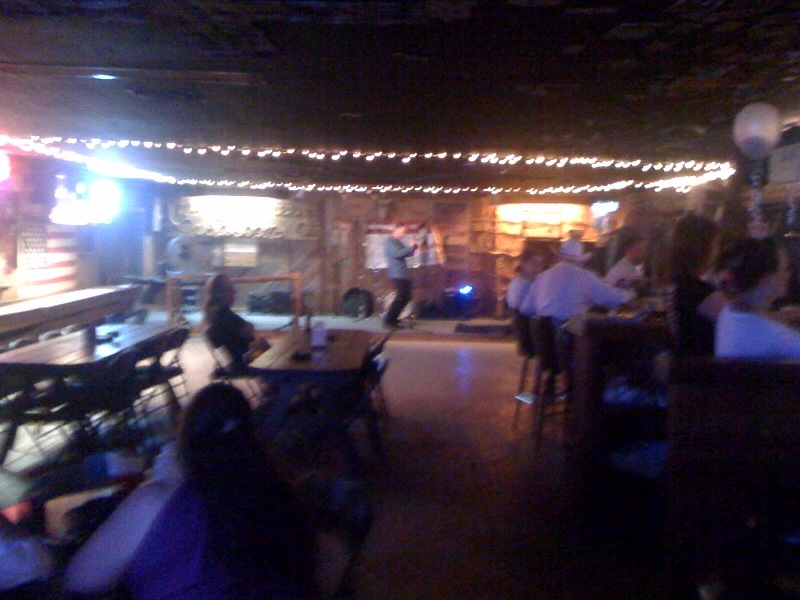 This place definitely has its locals, like all good juke joints in small towns. A solid mix of young, middle aged and already tipsy were chilling when we arrived at 7:30. The volume increased as the night, and the band, wore on. The beer was ice cold and the bartender was attentive without being annoying. Small groups of people chatting, with minimal in and out. It never got packed and vibe was still relaxed when we left, about 11:30. On the way out, we chatted with an 80 year old lady sipping on a margarita, who told us how much she loves this place. If that’s not a good enough endorsement, then sixth street is where you should be. Armadillo facts: Only the 3-Banded Armadillo can roll itself into a ball for protection, all of the other 19 species use their speed and incredible digging abilities to escape predators. They can hold their breathe for 6 minutes and are excellent swimmers. If they can’t dig under something, armadillos will climb over it and are quite capable of scaling fences and trees. I held a baby armadillo once. It promptly peed on me.